The Multi Height Microposition Probe combined with the ResTest Test Unit is a versatile four point probing system. It includes a fine X-Y stage for positioning small samples under the four point probe tips. The X-Y stage can be easily removed for measuring large samples such as substrates up to 10″ x 10″, or tall materials up to 6″ tall. The Multi Height Microposition Probe comprises a hard anodised aluminium base 25cm wide, 29cm deep and 0.8cm thick. A 19mm diameter stainless steel column 20cm high screwed to the base supports the probe head raising and lowering mechanism incorporating the vertical slide, operating lever shaft, and micro-switch. The vertical slide carries the probe-head, secured by a clamp screw. The probe-head is positioned so that the micro-switch does not pass current until the probes have made contact; lost motion ensures that the current is switched off before the probes are raised. The probe arm can be easily positioned on the vertical shaft to various heights to allow probing onto either flat materials or large or thick materials. For example, a shallow dish containing LN2 could be placed on the base plate and the arm could be positioned to allow the probe to be lowered onto a sample submerged in liquid nitrogen. With the X-Y stage removed, materials up to 10″ x 10″ x 6″ tall can be positioned under the probe arm. If necessary, a taller vertical post can be supplied for use in measuring taller items. 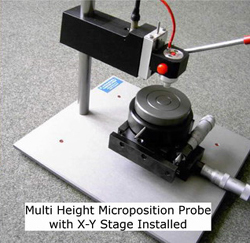 The Multi Height Microposition Probe includes a removable X-Y stage which can be bolted to the base plate to aid in positioning the materials accurately when probing onto small samples.